Being stuck in bed recuperating can be depressing for any Wild Rider. Foggy-headed and cooped up for days after my partial knee replacement gave me too much time to think and by that I mean feel sorry for myself. Multiply that with weaning off the Oxycodone and I had a pretty big crash. I regretted the timing of my surgery even though the x-ray showed I walked on borrowed time. The desire to get it over with and impulsivity was a perfect combo for, “I’ll take your next available appointment!” Two weeks wasn’t long enough to prepare myself mentally. I was also dealing with the guilt of sleeping so much and not writing. When my PT stopped by that Wednesday and told me I wouldn’t be off the walker by Friday since I seemed unstable and added I wasn’t ready to use the exercise bike, it broke me. The funk sunk in and continued to make itself comfortable the next morning. At 10:00 AM I needed something to eat with the Ibuprofen. I pushed my walker to the top of the stairs and then gingerly lowered my foot one step at a time. I shuffled behind my other walker to the kitchen and turned on the TV. 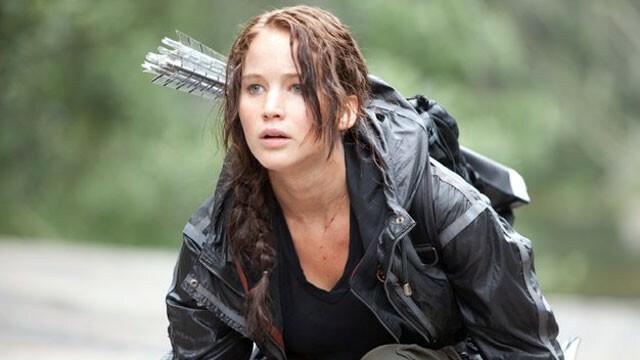 I became transfixed by an advertisement for The Hunger Games even though I’ve seen the movie and read the book. I thought, Katniss Everdeen was the ultimate badass. Filled with hope, the corners of my mouth formed a smile. The funk lifted. Hope forced funk out of my gloomy recesses and obliterated it. I ate my toast, took my pills, exercised at the counter, and then pushed my walker to the stairs. This time, instead of starting with my good leg and pulling my bad one up to the same step, I lifted my bad knee and walked up those freakin’ stairs like a normal person. Well, a normal person who grunts while grasping the banister. When the PT came a few hours later, she saw a huge improvement. I graduated from the walker to a cane. YES! Then she instructed me on how to use my exercise bike. Now all I need is a top hat. Can you pull yourself out of a funk? Start the New Year With a Revolution! Offended by the Carl’s Jr. Super Bowl Ad? I absolutely adore you, Susie. Thanks for sharing your strength with us. I wish you all the very best and more! Thanks Julie! I wish you the best too. We are both BADASS women! I’m in a pretty deep funk right now because I’m home computer-less. Yeah, my ancient MacBook bought its rainbow. But when I consider what you’re going through right now, I know I have it easy. I hope you make a full recovery soon. Thanks V! It was a weird couple of days. You know how optimistic I am. It was as if my brain was taken over by aliens! It’s all good and I’m more mobile every day. I even set up a date to meet my son for breakfast on Friday! Woohoo! Congrats on finding your inspiration to be more awesome! I feel like I have been pulling myself out of a funk on a regular basis in the last six months. While I’m an optimist by nature, there’s something about packing up your family and moving 4,500 km away from home to Canada’s Northwest Territories that brings on regular bouts of homesickness and guilt. And yet, they don’t usually last very long. I pick myself up by remembering why I moved, which was to find a life where I could spend more time with my family while growing my writing career. I have already seen significant improvements in both in just three short months. Thinking of this helps me get out of the lowest of lows. That is so great! Moving is extremely stressful. Just learning where all the light switches are in the dark, takes time. We can reprogram our brains with conscious positive thinking while making the choice to be happy. It takes perseverance, but it’s worth it! I found out it was the Oxy that placed me in my funk. I bet that’s why people get addicted. If I had taken a pill, the fog would have lifted. Good thing I got rid of the pills! I never want to take them again! Thanks for the reply! Having to be on such strong medication must have been tough! I insisted on getting through the pain of my two planned c-sections on Tylenol and Advil alone. Then again, even though they were major surgeries, I completely understand there are many procedures that are much more painful. Good luck with your continued recovery! I couldn’t choose. I think Ibuprofen and Tylenol work better than Oxy, but my doctor wouldn’t let me go on them until my last belly shot of blood thinners. Thank you! You are so sweet! Thanks so much. I know I’ll be glad I did it. I suffered silently for years after skiing or playing tennis. I didn’t even dance very much in the last year. I look forward to being pain-free! Woohoo! Sorry it was so hard. I’m glad your back! Thanks Gibber! I’m off the cane except when out of the house and every day I see improvement. Yay!!! You ARE one badass mama, Susie. Woot, woot, woot! Keep up the great work, but take it easy on yourself at the same time. If you can figure that out. Thanks Peg!!! That person I became for a few days was the polar opposite of me. She is banished for good! I’ll never take Oxy again. I think I’ll be fine as long as I keep doing everything they tell me. My PT said I was the most compliant patient she’d ever had! (It must be the good Catholic girl in me. 🙂 ) I don’t want to push and be up all night. I’m driving to PT today all by myself. WOOHOO! RIGHT???? I’m so glad to be over that. I didn’t recognize myself. My nurse who took out my staples said Oxy caused the funk. My in home PT was amazing. She has me riding 20 minutes on the exercise bike! I will be driving to my first Out-patient PT appt. today. I wonder what she’ll think! Thanks so much Widdershins! We are both so badass!!! I was down and out with a terrible cold this past week. And, when I’m sick, that’s when all those feelings of self-doubt come seeping in and making themselves at home. So, not only did I feel horrible physically, but emotionally too. I did pull myself out of my funk — by writing. It works every time! That, and snuggling with my son during a movie. Can’t get much better than that. That works for me too! It’s the best therapy around. I hope you’re feeling better. I found out the Oxy was the cause for those three dark days. Now I know what it’s like to truly feel depression. Thank God it was just drug induced and I could snap myself out of it. It feels great to be happy and hopeful again! I’m badass lucky: I had a head injury when another cyclist crashed into me while I was cycling on a bike path…on New Year’s Day. So just walking around now before returning to bike which won’t be for another few months. No happy dancing yet, but some happy shimmying! Thanks Pat! It will be worth it once it’s healed up. Sorry to hear you had to have the surgery, but I admire your determination. It’s frustrating when our bodies don’t do what we want them to do. Hopefully things are healed up for you now.